Our Liver & Hepatology team provides a seamless care delivery system that begins with assessment and diagnosis and culminates in a comprehensive treatment plan that may span many specialties. The Multidisciplinary Care (MDC) Team is represented by physicians who stay apprised of the most recent advances in therapy within the following specialties: Hepatology, Diagnostic and Interventional Radiology, Pathology, Liver Transplant Surgery, Surgical Oncology and Medical and Radiation Oncology. Comprehensive Liver Center patients have access to the most innovative therapies as they emerge and may also have the opportunity to participate in nationwide clinical research trials. Communication with referring physicians throughout the process plays a significant role in the success of the treatment plan. Our specialists work in collaboration with other health care institutions and physicians to offer cutting edge technology and procedures for patients who may receive services not only from Hartford HealthCare but also continue to receive follow-up care in conjunction with their established provider(s). The Comprehensive Liver Center at Hartford Hospital is the first healthcare facility in Connecticut to acquire FibroScan. The FibroScan provides a fast, painless assessment of liver health. It is a non-invasive test used to assess liver stiffness. Results are immediate and show the evolution of health of your liver. The entire FibroScan test session requires 15-20 minutes and can safely be repeated. The liver is the largest internal organ and central to people’s health and well-being. 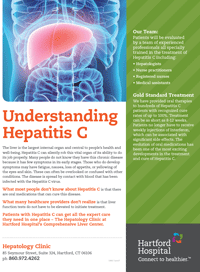 Hepatitis C can silently rob this vital organ of its ability to do its job properly. Many people do not know they have this chronic disease because it has few symptoms in its early stages. Those who do develop symptoms may have fatigue, nausea, loss of appetite, or yellowing of the eyes and skin. These can often be overlooked or confused with other conditions. The disease is spread by contact with blood that has been infected with the Hepatitis C virus. What most people don’t know about Hepatitis C is that there are oral medications that can cure this disease. What many healthcare providers don’t realize is that liver function tests do not have to be elevated to initiate treatment. Patients with Hepatitis C can get all the expert care they need in one place – The Hepatology Clinic at Hartford Hospital’s Comprehensive Liver Center. The incidence of liver cancer in the United States is increasing and will continue to increase over the next 10 to 20 years. Patients with underlying liver disease due to conditions including Hepatitis B, Hepatitis C, alcohol and obesity are at increased risk. The good news is that liver cancer is now curable in over 90% of patients if it is diagnosed and treated early. It is important to know that there are still many good treatments for even more advanced cancers, though they may not provide a cure. The only way to diagnose liver cancer early is to screen on a regular basis with blood tests and imaging studies. The Comprehensive Liver Center at Hartford Hospital specializes in the diagnosis and treatment of liver disease including liver cancer. All patients with liver disease seen in The Comprehensive Liver Center are assessed for cancer risk and placed in regular screening programs if appropriate. Once a cancer is diagnosed, patients are scheduled for evaluation in the Multidisciplinary Liver Tumor Clinic which is part of the Comprehensive Liver Center and includes the same group of health care providers. This clinic is a joint venture between the Comprehensive Liver Center and the Helen & Harry Gray Cancer Center. Our focus is to bring together specialist from all different fields including Oncologists, Liver Surgeons, Interventional Radiologists and Hepatologists (Liver Doctor) to provide state of the art, compassionate care for a patient with liver cancer. Our goal is to have an initial evaluation including imaging studies, laboratory work and health care visits in the same day leading to a diagnosis and treatment plan that day. A letter summarizing the Clinic visit and treatment recommendations is sent to both your referring and primary care physicians. Treatment for Liver Cancer depends on the size and number of the liver cancers and if there is involvement of the blood vessels of the liver, lymph nodes or other organs. There are now many options to treat liver cancer which can be given alone or in combinations. Your Hepatologist will help monitor your treatment course and take care of any problems related to your liver disease. Thermal ablation – Imaging guided techniques to kill tumors where they live with extremes in temperature. Cryoablation – targeted freezing of tumors using thin probes and CT scan and ultrasound guidance. This is an outpatient procedure requiring only mild sedation. Microwave ablation – targeted heating of tumors to lethal temperatures using precisely placed microwave probes. This is also an outpatient procedure. Transarterial Chemoembolization (TACE) – A thin tube is threaded into the artery feeding the tumor in the liver and tiny beads containing a powerful anticancer drug are injected. They block tumor blood flow and expose the tumor to a high dose of drug. Radioembolization – The same approach as with chemoembolization, but tiny resin spheres (SirSpheres) containing radioactive yttrium are injected instead of the drug-containing beads. The radiation dose is very high to the tumor with almost nothing getting to surrounding normal liver. Sorafenib (Nexavar) is a pill used to treat advanced liver cancer when other treatments are not indicated or in combination with other treatments. There are many other new treatments on the way. External radiation therapy is sometimes used to kill cancer cells and shrink the tumor. Radiation can be used in combination with other treatments and can help prolong survival. For those who meet liver transplant criteria, this is an excellent option. It treats the cancer, decreases any risk of cancer recurrence by removing the liver and also treats underlying liver disease. A candidate for transplantation can be evaluated and transplanted at Hartford Hospital through the Comprehensive Liver Center. The tumor and nearby tissue (and possibly lymph nodes) are removed. New types of treatments are being investigated in clinical trials. We can help you access both national and local clinical research trial opportunities. The Palliative Care Team is available for consultations and supportive care to help improve quality of life. All patients are also provided with the services of an Oncology Certified Nurse Navigator (OCNN). The OCNN will help to coordinate care, provide emotional support and education and make referrals to supportive services as needed. Services may include social work, nutritional consultations, financial counseling, home care services and integrative therapies. The OCNN may be reached at 860-972-4184. The Comprehensive Liver Center at Hartford Hospital utilizes a coordinated, multidisciplinary approach to liver cancer offering cutting edge treatment. This individualized, streamlined approach to care results in reduced waiting and increased patient satisfaction. By bringing the combined knowledge of our specialists to you over the course of one day we place the patient at the center of care and demonstrate our commitment to diagnose, evaluate and provide treatment in the timeliest manner to ensure best possible health outcomes. We are confident you will find a team of dedicated professionals at The Comprehensive Liver Center at Hartford Hospital who look forward to the opportunity to provide expert care to meet your health needs. Hartford Hospital was founded in 1854. It is the major teaching hospital affiliated with the University of CT Medical School, serving the New England region. Hartford Hospital, a Level 1 Trauma Center, pioneered the use of robotics in surgery.